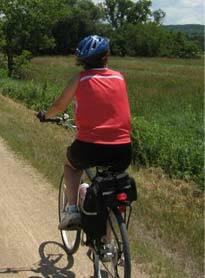 Let’s gather on Tuesday, July 17th at 9:15 a.m. to sign in and get bikes ready for a ride on the Fox River Trail. We will meet at the Gail Borden Library in Elgin, 270 N. Grove. We will depart at 9:30, riding the trail north to Panera’s in Crystal Lake. Total mileage about 32 miles at a casual pace, no one left behind. If you’d like a shorter ride, you can join us at the Depot in East Dundee (319 N. River) at approximately 10:00; round trip from there will be 20- 22 miles. Faster riders are welcome to ride ahead. Please let me know if you are coming, for 2 reasons: so we don’t leave without you, and also so that Howard and Anna can bring your jersey or T-shirt, if you still haven’t received yours yet. If there is any reason to cancel, I’ll send an email by 7:30.
meet at the Gail Borden Library in Elgin, 270 N. Grove.